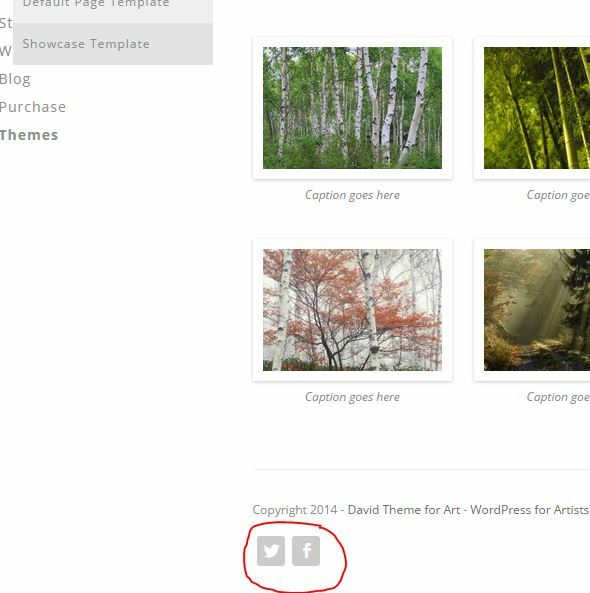 All Artbiz Artist Themes support at least one WordPress menu. If Artbiz installed WordPress and set up your site, then you will have a menu created. In the example below you can see that the main menu has already been added and populated. The “main menu” will be selected to appear in the “Theme Location” (see #2 below); again, already done for you. Use this tutorial to create a new menu, add new pages to the existing menu or change the order that your pages appear in your site’s navigation. 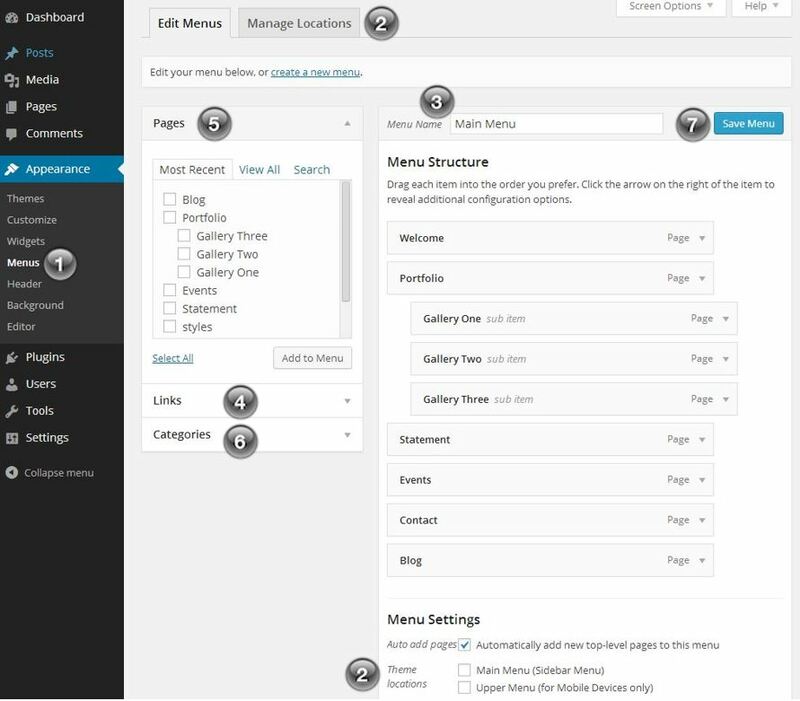 You will learn to manage a WordPress built in menu through the drag and drop method. 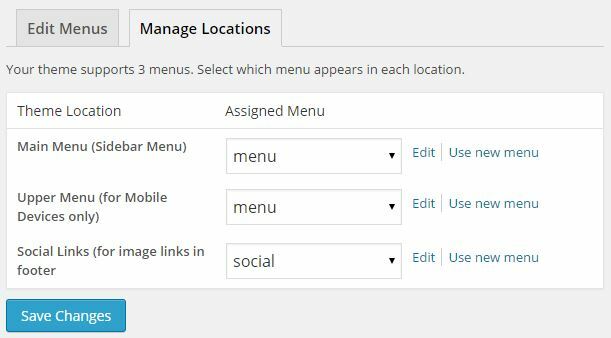 Note: If you don’t create or use a menu, by default, WordPress will add your pages to the site navigation. In this case you will need to assign a page order number when creating a page. It’s much easier to use menus. Also, use WordPress menus to add custom links to external websites or add a dummy parent (a menu item that is not linked to a page) for child pages (sub-pages). Theme Locations: This area tells you how many areas are available to have a menu. Even if your theme doesn’t support menus, you can create a menu to use in your sidebar by using the “custom menu” widget (see using widgets). The image above indicates the menu area for the new responsive themes. If you want to create a menu that will only show on mobile devices you can do so and select it here. Otherwise select and use the Main Menu. See #4 below on the Social Media menu option. 1. To create a new menu. click the link “create a new menu” and a blank menu page will appear. 2. Give the menu a name. The menu name is for your own use so you’ll know which menu is which. The menu name does not appear on the site. 4. Once the menu has been created, add your menu items as described in items 4, 5 & 6 below. Then drag and drop the menu items into any order you want, as well as nest them with another item by pulling your mouse to the right and drop when you see the indent. 5. Click the blue “save menu” button. Custom Links: If you want to create a link to an external site, Facebook or Twitter, you can add a custom link to your menu. Go to the site you want to link to and copy and paste the URL from the browser address bar into the URL box. Then provide a label (the label can be whatever you want) and click “add to menu”. All Artbiz pre-designed themes have a social media menu in the footer. 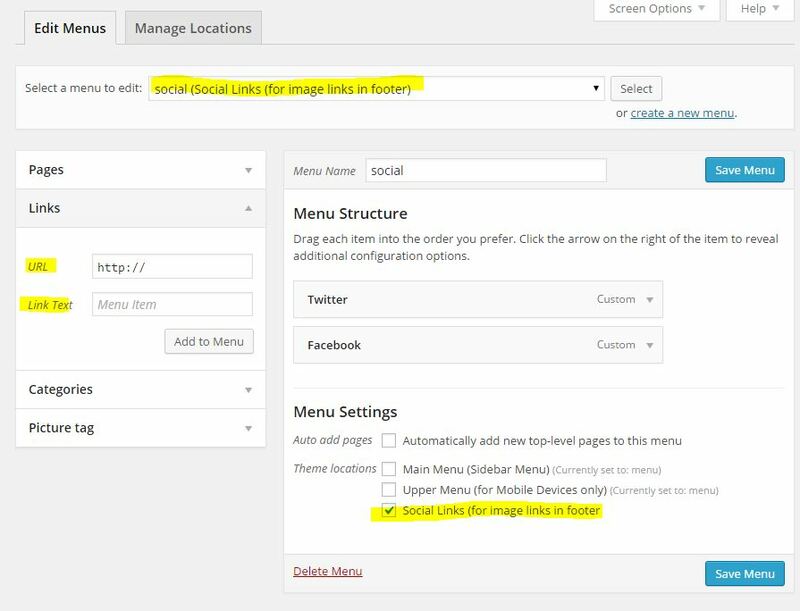 Follow the instructions on how to create a new menu and assign it to the Social Media location. Use Links as described above to add icon based links to your social media sites. Pages: This lists all the static pages currently on your site. To add them to the menu, check the box next to the ones you want and click the “Add to Menu” button. You can also click “select all” to have all items appear. There are three tabs at the top of this area that provide options to find pages; Most Recent, View All or Search if you have many pages. Categories: The proceedure to add blog categories is the same as adding pages (see #5 above). NOTE: If your site’s landing page is set up for a static page (see Landing Page) then you may not want to add categories, since the page you created for your blog will appear in the navigation by adding the page you created for it. SAVE, SAVE, SAVE: Every time you make a change, add or remove menu items you must save the menu for the changes to take effect. Once you have your menu populated you can change the navigation labels. The screenshot below shows a menu item in the open position. Navigation Label: This is the actual name of the page that you want to appear in the menu. It can be a shortened version of the original name. Title Attribute: Good SEO (search engine optimization) practice is to provide a title attribute; a short description of what is on that page. It also appears when your visitor’s mouse hovers over a menu item or any link on your site. Original: If you name your pages with a SEO friendly title, like the example shows, it may be too long for your menu. This is why you would provide a navigation label as outlined in #2 above. Remove | Cancel: If you change your mind and want to start over, click cancel. To remove an item from the menu, click remove. This doesn’t delete the actual page only removes it from the menu. A number of artists like to nest their Bio, CV and Artist Statement with a parent menu item called About or About the artist without the navigation item click-able. 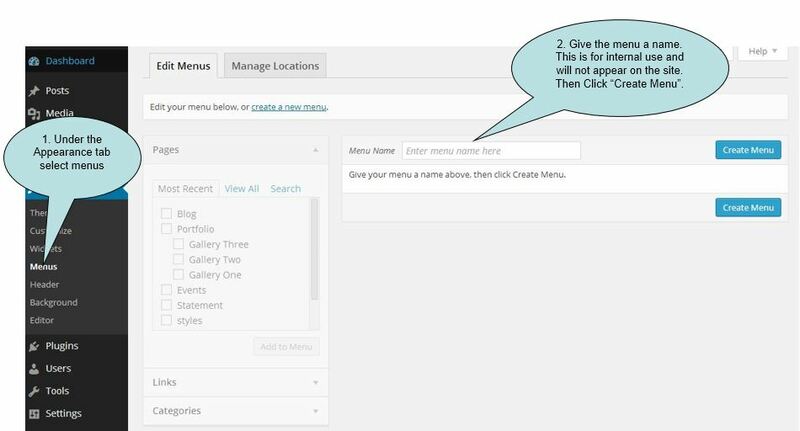 To do this without creating a page that you may not have content for, you can create a menu item that does not link. When a visitor hovers over the About menu item, a drop down menu will appear with links to your sub pages. 2. In the Navigation Label, provide the dummy link with a label and click add to menu. 3. Drag and drop the pages you want listed under the dummy link and nest them by pulling and dropping the item to the right. Child pages will appear indented. 4. Save the menu and refresh your browser to see the changes. I’m reposting this question because I’m not sure what happened to it and I never got an email alert that it was answered. I added links to my social media site pages – Facebook, Instagram, and Saatchi Art. They show up as tiny black and white icons at the very bottom of the website pages. They are hardly noticeable compared with the full color larger social media icons already on every page that can be used for posting to those sites. Also, the color icons open up a new window whereas links to my pages take a visitor away from my website. What’s you advice (or can you suggest a website example) for managing all this well without distracting from website content. Hi Kim, when hover over “Portfolio” in the side menu, i get the 2 sub menus- Recent Work and Archive. when i click on either of them the right group of images is tiled out and there is a label above the images that says the correct Recent Work or Archive. But on the Portfolio page, there are the 2 thumbnails for those same 2 groupings- Recent Work and Archive. If i click on those thumbnails, I get the same changed page with the correct grouping of images. BUT the title above them both says “Portfolio” instead of “Recent Work” or “Archive”. How do i change that label? You need to change the page you have the gallery linked to. You will find that inside the gallery in top task pane on the right. There’s a drop down menu to choose the page. Thanks Kim, that worked perfectly. When I was trying to figure out the pages and galleries, I set up too many. I realized I was stepping on the ones you’d set up and then thought I’d fixed that when I deleted the “extra” pages. All good now. Lastly, can the thumbnails be made larger for Archive and Recent Work on the Portfolio page? Is it possible to have both the menu on the left and a footer menu. I see this more and more and like the fact that you can access menu at the bottom of the page. Sometimes the menus are smaller in type and unobtrusive, which is what I’m looking for. Two other questions: the type under the thumbnails for the galleries is a gray color, but I don’t see an option for that type in Appearance>Customize. Also, I just added another gallery. All is fine, except that a thumbnail is not appearing at the bottom with the other gallery thumbnails. What am I doing wrong??? Currently the only way to add a menu at the bottom of the page is to use the “Custom Menu” widget. Go to Appearance > Widgets to add. The text color is applied by the plugin for the thumb, sorry not currently available to change. In order for the new gallery thumb to show, check that a preview image has been selected inside the gallery in the top task pane and that the gallery has been added to the Album. Kim, I seemed to have removed all the thumbs now from the front page. Clearly, I’m not understanding something! When I go to Gallery>Album, I can’t seem to drag and drop the galleries onto the album that I select. (I only have one at the present–now named “Portfolio.”) It looks all right in Appearance>Menu. I have the feeling that this is not complex. I’m just missing it! BTW, the album page is where I think I made the action that removed the thumbs. I was trying to drag the gallery block for “Murals,” and that’s when the change occurred, but I couldn’t get them back to where they were before. It looks like you somehow removed all the galleries from the album. Go back to the Album and drag and drop the galleries into the left task pane and click update. Once you do that the thumbs will reappear on the site in the footer widget area. Hi Kim, I am updating my site and wanting to remove the picture of me that links to the biography, which I am not including any more. I managed to remove the page itself and in the menu but not quite sure how to remove the photo link. Do you mean the one in the sidebar on your home page? Kim Im having a problem w my menu. If you look at my home page, you see that Landscape and Still Life appear on the menu above Portfolio and that Still Life also is under Portfolio, but it is a different template. When you go to Menus to change, Landscape appears twice under Portfolio, but not above. I’ve tried everything I can think of, but cannot get the menu to appear correctly. I probably can just delete one of the landscape pages that appears under portfolio in the menu mgmt area, but don’t know which to delete and would prefer not to lose my work. All you have to do Linda is go to Appearance > Menus and drag and drop into place. It appears twice because you created a new page called Still Life but also changed the title of the page with the permalink “gallery-two”. You have content on both pages. It would be best to just keep the one you like and delete the other. Both pages are using the same template it’s just that the content is different which may make it appear that’s a different template. To figure out which one to delete go to the page on your live site and navigate to the one you want to delete, click edit page on the admin menu or at the bottom of the content. Once the page is open in the editor click “move to trash” next to the blue update button. Hi Kim, is there a way to change the font of the site title, tagline or menu? The best option is to use a plugin unless you want to learn CSS or hire me (for a nominal fee) to embed any Google Font you want. This is the plugin that I recommend http://wordpress.org/extend/plugins/font/. I do not provide instruction or support for this plugin. Use the ones that are listed under Watercolours and move the duplicates to the Trash and then empty the Trash. This will remove them from the list of pages available to add to your menu. 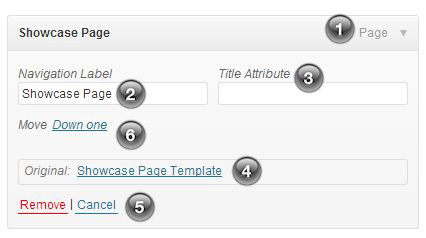 It looks like you created a new set of pages, maybe through the page creation tool inside Manage Gallery. TIP: If your theme comes with a footer menu, you need to activate a menu for it in order to manage the pages that appear there.